The brains of some people with autism spectrum disorder grow faster than usual early on in life, often before diagnosis. Now new research from scientists at the Salk Institute has used cutting-edge stem cell-based techniques to elucidate those mechanisms that drive excess brain growth, which affects as many as 30 percent of people with autism. These findings show that it is possible to use stem cell reprogramming technologies to model the earliest stages of complex disorders and to evaluate potential therapeutic drugs. The Salk team, led by Alysson Muotri, discovered that stem cell-derived neurons, derived from stem cells that had been made from cells taken from autism patients, made fewer connections in culture compared to cells from healthy individuals. These same scientists also restored cell-cell communication between these cells by adding a growth factor called IGF-1 (insulin-like growth factor-1). IGF-1 is in the process of being evaluated in clinical trials of autism. In the United States alone, autism affects approximately one out of every 68 children. Autistic children have problems communicating, show an inhibited ability to interact with others, and usually engage in repetitive behaviors. Mind you, the symptomatic manifestations in autistic children can vary dramatically in type and severity. Autism, to date, has no known, identified cause. In this new study, Gage and others created iPSCs from autism patients whose brains had grown up to 23 percent faster than usual during toddlerhood but had subsequently normalized. These iPSCs were then differentiated into neuron precursor cells (NPCs). Examinations of these NPCs revealed that the NPCs made from iPSCs derived from autism patients proliferated faster than those derived from typically developing individuals. This finding supports a theory advanced by some experts that brain enlargement is caused by disruptions to the cell’s normal cycle of division, according to Marchetto. In addition, the neurons derived from autism-specific iPSCs behaved abnormally in culture. They fired less often compared with those cells derived from healthy people. The activity of these neurons, however, improved if they were treated with IGF-1. IGF-1 enhances the formation of cell-cell connections between neurons, and the establishment and stabilization of these connections seem to normalize neuronal function. Muotri and Gage and others plan to use these patient-derived cells to elucidate the molecular mechanisms behind IGF-1’s effects. They will examine changes in gene expression and attempt to correlate them with changes in neuronal function. Although the newly derived cells are far from the patients’ brains, a brain cell by itself may, hopefully, reveal important clues about a person and their brain. This work was published in the journal Molecular Psychiatry: M. C. Marchetto et al., “Altered proliferation and networks in neural cells derived from idiopathic autistic individuals,” Molecular Psychiatry, 2016; DOI: 10.1038/mp.2016.95. The dream of cardiologists is to have stockpiles of cardiac progenitor cells that could be transplanted into a sick heart and regenerate it. Even more remarkable would be a source of heart cells for newborn babies with congenital heart problems. What about making these cells before they are born? Science fiction? Probably not. Dr. Shaun M. Kunisaki from Mott Children’s Hospital and the University of Michigan School of Medicine and his colleagues made heart progenitor cells from Amniotic Fluid Cells. These cells were acquired from routine amniocentesis procedures, with proper institutional review board approval. These amniotic fluid specimens (8–10 ml), which were taken from babies at 20 weeks gestation, were expanded in culture and then reprogrammed toward pluripotency using nonintegrating Sendai virus (SeV) vectors that expressed the four commonly-used reprogramming genes; OCT4, SOX2, cMYC, and KLF4. The resulted induced pluripotent stem cell (iPSC) lines were then exposed to cardiogenic differentiation conditions in order to generate spontaneously beating amniotic fluid-derived cardiomyocytes (AF-CMs). AF-CMs were formed with high efficiency. After 6 weeks, Kunisaki and his team subjected their AF-CMs to a battery of quantitative gene expression experiments. They discovered that their AF-CMs expressed high levels of heart-specific genes (including MYH6, MYL7, TNNT2, TTN, and HCN4). However, Kunisaki and others also found that their AF-CMs consisted of a mixed population of differentiated atrial, ventricular, and nodal cells, as demonstrated by various genes expression profiles. All AF-CMs were chromosomally normal and had no remnants of the SeV transgenes. Functional characterization of these AF-CMs showed a higher spontaneous beat frequency in comparison with heart cells made from dermal fibroblasts. The AF-CMs also showed normal calcium currents and appropriately responded to neurotransmitters that usually speed up the heart, like norepinephrine. Collectively, these data suggest that human amniotic fluid-derived cells can be used to produce highly scalable sources of functional, transgene-free, autologous heart cells before child is born. Such an approach may be ideally suited for patients with prenatally diagnosed cardiac anomalies. Induced pluripotent stem cells (iPSCs) have many of the characteristics of embryonic stem cells, but are made from mature cells by means of a process called cell reprogramming. To reprogram cells, particular genes are delivered into mature cells, which are then cultured until they h:ave the growth properties of pluripotent cells. Further tests are required to demonstrate that the growing cells actually are iPSCs, but once they pass these tests, these cells can be grown in culture indefinitely and, ideally, differentiated into just about any cell type in our bodies (caveat: some iPSC lines can only differentiate into particular cell lineages). Theoretically, any cell type can be reprogrammed into iPSCs, but work from many laboratories has demonstrated that the identity of the founder cell influences the type of cell into which it can be reprogrammed. Founder cells can be easily acquired from a donor and come in one of four types: fibroblasts (in skin), keratinocytes (also from skin), peripheral and umbilical cord blood, and dental pulp cells (from baby teeth). A variety of laboratories from around the world have made iPSC lines from a gaggle of different founder cells. Because of the significant influence of founder cells for iPSC characteristics, the use of iPSCs for regenerative medicine and other medical applications requires that the desired iPSC line should be selected based on the founder cell type and the characteristics of the iPSC line. However, the founder cell identity is not the only factor that affects the characteristics of derived iPSC lines. The methods by which the founder cells are reprogrammed can also profoundly contribute to the differentiation efficiency of iPSC lines. According to Yoshinori Yoshida, Associate Professor at the Center for iPSC Research and Application (CiRA) at Kyoto University, the most commonly used methods of cell reprogramming utilize retroviruses, episomal/plasmids, and Sendai viruses to move genes into cells. The cells found in blood represent a diverse group of cells that includes red blood cells that carry oxygen, platelets that heal wounds, and white blood cells that fight off infection. All the cells in blood are made by bone marrow-specific stem cells called “hematopoietic stem cells.” The production of clinical grade blood has remained a kind of “holy grail” for cellular reprogramming studies. Some scientists have argued that in order to make good-quality hematopoietic cells, the best founder cells are hematopoietic cells. Is this true? Yoshida and his colleagues examined a very large number of iPSC lines that were made from different founder cells and with differing reprogramming methods. The results of these experiments were published in the journal Cell Stem Cell (doi:10.1016/j.stem.2016.06.019). Remarkably, Yoshida and his crew discovered that neither of these factors has a significant effect. What did have a significant effect were the expression of certain genes and the position of particular DNA methylations. These two factors were better indicators of the efficiency at which an iPSC line could differentiate into the hematopoietic stem cells. “We found the IGF2 (Insulin-like Growth Factor-2) gene marks the beginning of reprogramming to hematopoietic cells”, said Dr. Masatoshi Nishizawa, a hematologist who works in Yoshida’s lab and is the first author of this new study. Higher expression of the IGF2 gene is indicative of iPSCs initiating differentiation into hematopoietic cells. Even though IGF2 itself is not directly related to hematopoiesis, its uptake corresponded to an increase in the expression of those genes involved in directing differentiation into hematopoietic stem cells. Although IGF2 marked the beginnings of differentiation to hematopoietic lineage, the completion of differentiation was marked by the methylation profiles of the iPS cell DNA. “DNA methylation has an effect on a cell staying pluripotent or differentiating,” explained Yoshida. Completion of the final stages of differentiation was highly correlated with less aberrant methylation during the reprogramming process. Blood founder cells showed a much lesser tendency to display aberrant DNA methylation patterns than did other iPSC lines made from other founder cells. This probably explains why past experiments seemed to indicate that the founder cell contributes to the effectiveness of differentiating iPS cells to the hematopoietic stem cell lineage. These findings reveal molecular factors that can be used to evaluate the differentiation potential of different iPSC lines, which should, hopefully, expedite the progression of iPSCs to clinical use. Nishizawa expects this work to provide the basis for evaluating iPSC lines for the preparation of other cell types. “I think each cell type will have its own special patterns,” he said. In 2012, John B. Gurdon and Shinya Yamanaka won the Nobel Prize in Physiology or Medicine “for the discovery that mature cells can be reprogrammed to become pluripotent.” Since that time, induced pluripotent stem cells (iPSCs) have largely taken the stem cell scene by storm. Because of the ease with which iPSCs can be made from just about any mature cell type, and because they can be made so more cheaply and faster than embryonic stem cells, they are the perfect pluripotent stem cell for laboratory use. The additional advantage to iPSCs is that can instantly reflect the genetic defect of the patient from whom they are made. Therefore, they are provide excellent model systems for a variety of genetic diseases and provide a kind of “disease in a dish” system by which the cellular and molecular characteristics of a disease can be modeled in cell culture. In addition to their experimental utility, many scientists have sought to promote iPSCs for clinical purposes. However, before iPSCs can be used in the clinic, their safety must be established beyond question. Despite their success in many animal models (most in rodents), the long-term safety of iPSC derivatives has yet to be firmly demonstrated. To that end, three different experiments have added to our concerns about the safety of iPSCs. For these and other reasons, several scientists have hypothesized that if iPSCs derivatives are going to be used in a clinical setting, they will need to come from young, healthy donors. In particular, blood cells from umbilical cord blood can be matched to just about any tissue and can be easily converted into iPSCs. Therefore, allogeneic iPSC derivatives seem to be the best way to go about treating particular diseases. That being said, there are three studies about the safety of iPSC derivatives that make important contributions to the debate. The first study comes from the laboratory of Shoukhrat Mitalipov at the Oregon Health and Science University. Mitalipov and his team have examined the mitochondrial genomes of iPSCs made from older patients. Mitochondria are small, vesicles surrounded by two membranes, within cells that are the energy-production structures of most cells (not bacteria). Mitochondria also contain their own DNA molecules that express a variety of mitochondrial-specific genes and their own bacterial-like ribosomes that synthesized the mRNAs made from those genes into proteins. However, the vast majority of mitochondrial proteins are encoded on genes housed in the nucleus. Mutations in genes encoded by the mitochondrial genome are rather devastating and are responsible for several really nasty (albeit rare) genetic diseases. These mitochondrial genetic diseases include: Mitochondrial myopathy, diabetes and deafness, Leber’s hereditary optic neuropathy (includes visual loss beginning in young adulthood, progressive loss of central vision due to degeneration of the optic nerves and retina), Leigh syndrome subacute sclerosing encephalopathy (disease usually begins late in the first year of life, although onset may occur in adulthood; a rapid decline in function occurs and is marked by seizures, altered states of consciousness, dementia, ventilatory failure), neuropathy, ataxia, retinitis pigmentosa, and ptosis (progressive symptoms as described and dementia), Myoneurogenic gastrointestinal encephalopathy (gastrointestinal pseudo-obstruction and neuropathy), Myoclonic epilepsy with ragged red fibers (progressive myoclonic epilepsy, “Ragged Red Fibers” or clumps of diseased mitochondria accumulate in the muscle fiber, short stature, hearing loss, lactic acidosis, exercise intolerance), mitochondrial myopathy, encephalomyopathy, lactic acidosis, stroke-like symptoms (MELAS). Mitochondrial DNA mutations have long been thought to be a driving force in aging and age-onset diseases. Therefore, if iPSCs are made from older patients, will their starting cells have these mitochondrial mutations? In this study from Mitalipov’s laboratory, his team derived and sequenced 10 iPS clones from each patient tissue sample to get a better understanding of mitochondrial DNA mutations rates. They took samples of blood and skin samples from healthy subjects and patients with degenerative diseases, who ranged in age from 24-72 years old. In these pools of these sampled cells, the rate of mitochondrial DNA mutations was low. 20 iPS cell lines per patient were profiled. Ten of these lines were derived from skin cells and the other 10 were derived from blood cells. Sequencing of the mitochondrial genomes of the iPSC lines revealed higher numbers of mitochondrial DNA mutations, particularly in cells from patients older than 60 years old. Of the 130 iPSC lines analyzed, 80 percent of them showed mitochondrial mutations and higher percentages of the mitochondria per cell contained mutations. Such mitochondrial mutations can seriously compromise the ability of derivatives of these iPSC lines to carry out their desired function. 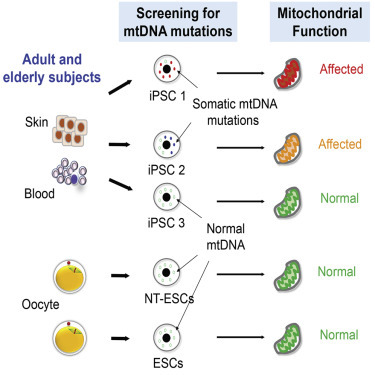 Mitalipov in his paper, which was published in Cell Stem Cell, 2016; DOI: 10.1016/j.stem.2016.2016.02.005, that all iPSC lines for use in human patients should be screened for mitochondrial mutations. One feature not addressed by Mitalipov and his colleagues is whether or not cells that may not show the signs of aging should be used to derived iPSCs, such as particular bone dormant marrow stem cells. If mitochondrial mutations aren’t bad enough Jennifer E. Phillips-Cremins and her coworkers at the University of Pennsylvania School of Engineering and Applied Science have found that the chromatin structures of iPSCs might prevent them from properly differentiating into particular derivatives. As previously mentioned in other blog posts, the DNA in the nuclei of our cells is packaged into a compact structure known as chromatin. Chromatin helps cells express those genes it needs to express and shut down other genes whose expression is not needed. Occasionally, iPSC lines show an inability to differentiate into particular cell types while others have the ability to differentiate into many cell types. According to this study by Phillips-Cremins and her team, defects in DNA packaging might explain these disparities in iPSC lines. By using experimental and computational techniques, Phillips-Cremins and her graduate student Jonathan Beagan identified chromatin conformations in a variety of iPSC lines. The DNA topology of embryonic stem cells and neural stem cells were also analyzed as comparisons. The three-dimensional DNA conformations of pluripotent stem cells are reorganized during differentiation. Phillips-Cremin and others discovered that when mature cells are reprogrammed to pluripotent cells, most pluripotency genes reconnect to their enhancers (which are crucial for their expression). However, when these same iPSCs are differentiated into neural progenitor cells, the interactions between pluripotency gene and their enhancers remain in some lines, which should not occur. This paper was published in Cell Stem Cell (2016), 18(5): 611–624. Therefore, the chromatin structure of iPSCs is also important. Finally, another paper reports some good news for iPSCs. Research from the Wellcome Trust Sanger Institute tracked the genetic mutations acquired by iPSCs when they are made in the laboratory. These cells came from the blood of a 57-year-old male subject. This research, led by Allan Bradley, showed that mutations arise 10 times less often in iPSCs than they do in cultured laboratory-grown blood cells. Furthermore, non of the iPSC-acquired mutations were in genes known to cause cancer. Bradley and his colleagues were able to trace the history of every mutation that each cell acquired from its extraction from the body to its reprogramming in the laboratory and propagation in culture. The techniques utilized in the Bradley laboratory can surely help scientists evaluate the genetic integrity of laboratory-derived iPSCs. This work was published in PLOS Genetics, 2016; 12(4): e1005932 DOI: 10.1371/journal.pgen.1005932. All in all, it seems that it is possible to make sound iPSC lines, but those lines must be properly screened before they can be used in a clinical setting to treat live patients. These three papers provide new ways to screen iPSC lines for ensure high levels of safety and efficacy. A research effort led by Dr. Sheng Ding from the Gladstone Institute and scientists from the Roddenberry Center for Stem Cell Biology and Medicine has successfully transformed skin cells into heart cells and brain cells using little more than a cocktail of chemicals. Previous work that sought to transdifferentiate mature, adult cells into another cell type used gene vectors (such as viruses) that genetically engineered the cells to express new genes at high levels. Because this new protocol uses no genetic engineering techniques, these results are nothing short of unprecedented. This work lays the foundation for, hopefully, being able to regenerate lost or damaged cells with pharmaceutical agents. In two publications that appeared in the journals Science and Cell Stem Cell, Ding and his collaborators utilized chemical cocktails to drive skin cells to differentiate into organ-specific stem cell-like cells and, then into terminally differentiated heart or brain cells. These results were achieved without genetically engineering cells. Mature heart muscle cells have very little regenerative ability. Once a patient has suffered a heart attack, the cells that have died are, for the most part, not replaced. Therefore, stem cell scientists have left no stone unturned to find a way to replace dead and dying heart muscle cells. Several clinical trials have transplanted mature adult heart cells or various types of stem cells into the damaged heart. However, such procedures have either not improved heart function or have only modestly improved heart function (with a few exceptions). Typically, transplanted cells do not survive in the hostile environment of the heart after a heart attack and even those cells that do survive fail to properly integrate into the heart. Also, the ability of transplanted cells to differentiate into heart cells is not stellar. Alternatively, Deepak Srivastava, director of cardiovascular and stem cell research at the Gladstone Institute, and his team pioneered a distinctly novel approach in which scar-forming cells in the heart of animals were genetically engineered to differentiate into heart new muscle that greatly improved heart function. Genetic engineering brings its own safety issues to the table and, for these reasons, chemical reprogramming protocols that can do the same thing might provide an easier way to drive heart muscle to regenerate local lesions. In the Science study, Dr. Nan Cao (a postdoctoral research fellow at Gladstone, and others applied a cocktail of nine chemicals to reprogram human skin cells into beating heart cells. By using a kind of trial-and-error strategy, they discovered the best combination of chemicals to transdifferentiate skin cells into multipotent stem cells. Multipotent stem cells have the ability to differentiate into several distinct cell types from several different types of organs. A second-growth factor/small molecule cocktail drove the multipotent stem cells to differentiate into heart muscle cells. Perhaps the most surprising result of this protocol is its efficiency. Typically, chemically-induced differentiation is relatively inefficient, but with Ding’s method, over 97% of the cells began beating. These chemically-derived heart muscle cells also responded appropriately to hormones, and they also molecularly resembled heart muscle cells (and not skin cells). Upon transplantation into a mouse heart, these cells developed into healthy-looking heart muscle cells within the heart of the laboratory animal. In the second study, published in Cell Stem Cell, which was authored by Gladstone postdoctoral scholar Dr. Mingliang Zhang, PhD, the Gladstone team created neural stem cells from mouse skin cells using a similar approach. Once again, the chemical cocktail that transdifferentiated skin cells into neural stem cells contained nine different chemicals. Some of the molecules used in the neural stem cell experiment overlapped with those employed in the heart muscle study. Treatment of the skin cells for about ten days with the cocktail transdifferentiated the skins cells into neural-like cells. Virtually all the skin cell-specific genes were shut off and the neural stem cell-specific genes were gradually activated. When these chemical-differentiated cells were transplanted into mice, the cells spontaneously differentiated into neurons, oligodendrocytes, and astrocytes (three basic nerve cells). The neural stem cells were also able to self-replicate, which makes them ideal for treating neurodegenerative diseases or brain injury.